This is my version of a famous castle that is in a famous book/movie series. Watch the connections, and please let me know if there are any improvements that can be made. Review by Nathan on 12/15/2016. Fun, beautiful and extremely cool. I love this map. It is extremely inventive and extremely challenging. - It looks like the Entrance Hall should connect to Viaduct Courtyard 1 and 2. - Training Grounds Entrance should not connect to Defence Against the Dark Arts Tower. - It would be great if the big brown connecting trail looped all the way above the Grand Tower. Right now it looks like it connects to Classrooms 10A and 10C. 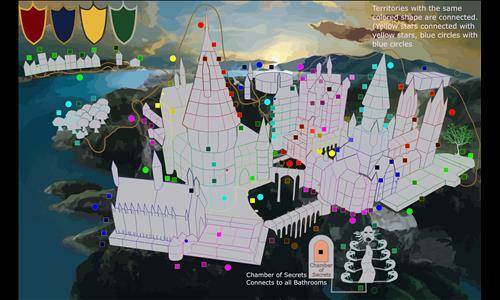 - The secret passages are well-reflected by the different colored stars (yellow stars connect to yellow stars, red to red, and so on). However, it's still easy to get them confused. Maybe you could use not only different colors but different shapes, as well, e.g., red triangles, blue diamonds, etc. - The Hogsmeade path appears to connect the various stores to each other, not just to Hogsmeade Station. This is misleading. - The Forbidden Forest is a bit isolated and may be overpowered as a starting location. Thank you for the feedback! I have fixed those connections, and I see what you mean with both types of connections. I will definitely try to implement these changes for you and the other players who make map-making worth it. Clear instructions good connections, nice detail, what could make this better would be some preset scenarios, or a community level. Review by namek on 12/16/2016. "Gunhilda of Gorsemoor Corridor" (Hufflepuff Tower) and "Passage By the One-Eyed Witch" (Grand Tower) can not be at two different places. I did some research and you are right... the one eyed witch is Gunhilda.... I have fixed this by changing the corridor to the Magical Chemistry and Physics Class. Review by RobGodkin on 12/31/2016. -The detail in this map is amazing (the little rooms and corridors, the background). start your matches like this to get the most fun out of your matches! "i belong to hufflepuff. i am first in my class in defense against the dark arts, and i buy a choclate frog as a snack once a week." Review by Angriest Angel on 1/12/2017. Review by warhawk on 1/16/2017. Super special map. The options on this map are mind bending. Not your typical Warlight map. Review by Xtremeone23 on 8/12/2017. I love this map. I actually used it in one of my community levels. The best part is probably connections. I love that they connect just like in the books. Surprisingly challenging. A great play. Review by Bonesoul on 7/15/2018. Review by UBC on 7/26/2018.